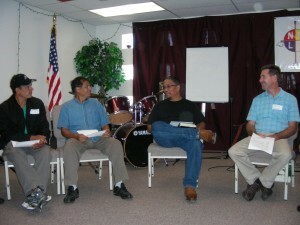 It’s a little taste of heaven this week in Albuquerque, N.M., as pastors of varying ethnicities have gathered to discuss church planting in the United States among their people groups. Gathering first at Native New Life Church, a Grace Brethren congregation in the International District of the city, they spent time in prayer for their various ministries. Then the host pastor, Arnold Betoney, shared about the ministry of Native New Life Church, which marks its 10th anniversary this year. He also talked about the history of the Navajo Nation. After taking a break to check into their hotel and visit Old Towne Albuquerque, the group joined the congregation of Native New Life for dinner, feasting on Indian Tacos, complete with Navajo fry bread. Representatives of several other Indian ministries in the metro area also shared about their ministries. Tomorrow, they travel to Window Rock, Arizona., the capital of the Navajo Nation, where they’ll experience the Indian reservation first-hand. The meetings are sponsored by Internationals USA and Grace Brethren International Missions and are underwritten by the Grace Brethren Investment Foundation.